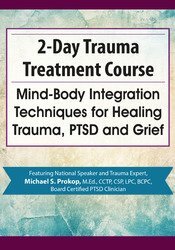 Michael S. Prokop, M.Ed., CCTP, CSP, LPC, BCPC, is a national speaker, Certified Clinical Trauma Professional, Consulting School Psychologist, Licensed Professional Counselor, American Psychotherapy Association Board Certified Professional Counselor-Diplomate, Sports Psychology Consultant and is a member of the International Association of Trauma Professionals (IATP). He specializes in grief and trauma therapy, relaxation therapy, rational emotive psychotherapy, anger management, mental toughness training, and more. As a consulting psychologist he has conducted hundreds of psychological evaluations of traumatized clients and continues to provide individual and group therapy for clients with various adjustments, intellectual, motivational and emotional challenges. His clinical expertise with traumatized clients is based on a long history of comprehensive professional experiences. These include providing support for children and families impacted by suicide, domestic violence, homicide, child abuse, sexual assault and accidental death. Michael has authored three children’s books regarding adjustment issues and his counseling experiences include more than 25 years in private practice, school districts, part time at The Developmental Clinic, and the rest at Kent State University teaching undergraduate psychology classes, graduate level workshops and also providing psychological counseling services for the T.R.I. Program (Toward Retention Intervention). Besides his private practice, he consults in numerous schools and agencies and is an Adjunct Professor at Ashland University. As an entertaining and enthusiastic speaker, he frequently lectures and provides seminars at state and national conferences. Financial: Michael Prokop is an adjunct instructor at Ashland University. He receives a speaking honorarium from PESI, Inc.
Nonfinancial: Michael Prokop is a member of the American Psychotherapy Association; National Education Association; National Association of School Psychologists; and Ohio School Psychologists Association.